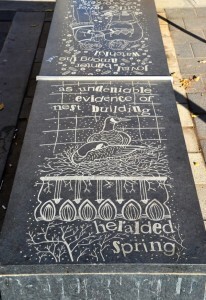 Location: 100 St. & Jasper Ave. through to 102 St. & Jasper Ave.
Holly Newman’s whimsical prose and illustrations, etched into the black granite of Jasper Avenue’s benches and planters, provide a delightfully creative touch to the street furniture. Evoking the grace and tenacity of Canadian geese, the 21 pieces can be enjoyed from any direction. For the purists at heart, A-K indicates the order of the artist’s preferred prose. Biography: Holly Newman received her Bachelor of Fine Arts from the University of Alberta in 1985. Since then she has exhibited extensively around Edmonton and throughout Canada. On her website, Newman writes: “Oh, the things that I have seen while walking through the city. A coyote prancing up the sidewalk from the river valley towards the city centre. A mouse struggling to climb the curb after crossing four lanes of traffic. A golden leaf falling from nowhere, landing on a guy’s shoulder and resting there for half a block.